This article is the third in a series of four articles about courtroom storytelling (links to part 1 and part 2). My goal in this series is to reveal some of the tricks of the persuasive storytelling trade in one place for the busy trial lawyer. I hope that these recommendations can serve as a pretrial checklist for anyone who wants to draft an opening statement. Here is the fifth of these ten tips. 5. It is crucial to make your audience care about the characters in your story. It’s never just about a company. It’s never just about the CEO, and if Hollywood can make you care about a mute trash robot named WALL-E, you can make your factfinders care about the characters in your story. A major way to lose an audience is to fail to develop characters that a jury will care about. you don’t develop such characters, your jury will either not care about your side or will turn against your client from the start. 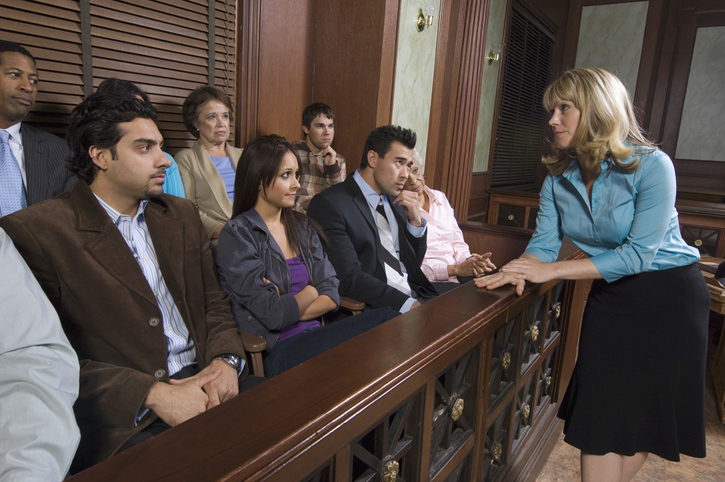 Unfortunately, about half of all trial teams fail to properly develop the characters in their litigation story, and their cases suffer terribly for it. The excuses are numerous: from ‘We’re a big company, we don’t have individual characters” to “Everyone on our side is perceived as bad.” These are just excuses. I can guarantee that 99.9 percent of the time, there will be characters that can be developed. Here is a step-by-step guide to using Joseph Campbell’s model of the hero’s journey so as to turn your story’s main character into a hero. To make this useful pattern more accessible, I have attempted to use plain language to describe the steps. My plain language description is followed in parentheses by the name that Campbell gave to it. Also, to help bring the process alive, I have matched each step with an example from a hypothetical legal and technical fact pattern, typical of the cases we most often see at A2L. Here, our heroine is a lower-level employee at a stagnant remote-control manufacturing company, and she has an idea for a breakthrough product -- a remote control operated not with a handheld device but by wireless physical hand gestures. Something Interrupts the Ordinary (Campbell's Call to Adventure): Describe the status quo as it was at the time. Then describe that moment when someone sees an opportunity for change or a new threat emerges. In the hypothetical example, remote controls are functional uninspiring devices that get lost, wear out and have undergone little change for 25 years, in the same era that saw the mass deployment of handheld phones and personal computers. Inspired by watching her nieces play a TV-displayed game that uses hand gestures instead of controllers, our heroine imagines a world where hand gestures alone can manipulate her television and replace standard remote controls. At work the next day, she hears a speech by the firm’s CEO who is looking for new ideas. Obstacles Arise (Campbell's Refusal of the Call): Share how obstacles arose from the very beginning that prevented your client from taking the leap of faith required to pursue the opportunity. Example: After hearing the speech, our heroine brings the idea to the attention of management at the remote-control factory and was laughed out of the executive suite. She figured they were in management for a reason and went back to manufacturing remote controls as before. A Mentor or Helper Appears (Campbell's Supernatural Aid): Explain how your client gets some unexpected assistance that is a sensible next step in bringing the opportunity to reality. Example: Our heroine attends a consumer electronics conference that shows off some new gaming technology that reminds her of her idea. She talks with the reps at the trade show booth about applications they’ve considered for their wireless controllers. They suggest she show them what she has in mind. A Big Step Forward (Campbell's Crossing of the First Threshold): Recount how your client made the decision to move forward toward the opportunity with a large clear step. Example: Our heroine makes the brave decision to leave her employer and set off on her own. Out with the Old, In with the New (Campbell's Belly of the Whale): Tell how your client demonstrated a willingness to embrace the opportunity in spite of the great odds. Example: Our heroine’s savings have run out, and she stays up night after night trying to perfect a prototype with the dream of returning to that gaming company to show off her work. Many Attempts with Mixed Results (Campbell's Road of Trials): Chronicle how your client tried to reach the opportunity time and time again. Usually, there are some successes and some failures. Example: She created prototype after prototype, and each had some success and some failure. Finding a Partner (Campbell's Meeting With the Goddess): Describe how your client came to find that right person or right organization that helped them achieve success. Example: Our heroine goes to the gaming company, shows off her prototype, agrees to sell the technology and joins the new firm to help them commercialize it. Temptation to Stray (Campbell's Woman as Temptress): Detail how your client was met with an opportunity to stray from the chosen path but chose the higher road. Example: Our heroine is contacted by her former employer, who offers to bring her back to the old firm for more money and an executive position at the company if she will share the new technology they are hearing rumors about. She declines the offer. Meeting with a Mentor (Campbell’s Atonement with the Father): Discuss how your client one day had a meeting with the person or organization at the center of the opportunity. Example: The Chairman of the Board stops by our heroine’s prototype lab to check out the new product in development and take stock of her. He says that they are going to bet big on her idea for the holiday season. A Period of Reflection (Campbell's Apotheosis): Explain how your client took some time to reflect on how far things progressed to date. Example: While on vacation, our heroine watches as her young nieces again use a wireless gaming device to entertain themselves on a rainy beach day and she increasingly sees her product as the future. Success (Campbell's Ultimate Boon): Share how your client achieved the goal set out in the opportunity. Example: The product is launching into stores, and the early reviews are positive from the technology press. Our heroine begins to realize that her idea was not only a good one but one with vast commercial potential. Don't Forget Where You Came From (Campbell's Refusal of the Return): Report how your client began to enjoy her success. Example: All of the press swoon over our heroine, and she becomes a fixture on panels at technology conferences worldwide, often traveling for weeks at a time. Her nieces miss seeing her. Remember Where You Came From (Campbell's Magic Flight): Discuss your client's return to her roots and journey home. Example: Our heroine, now fed up with long periods of time away from loved ones, puts an end to the fame treadmill and makes a surprise journey home to be with her family. Back to Reality (Campbell's Rescue from Without): Relate how your client had to return back to everyday life having achieved so much, only the world is now quite different for them. Example: Our heroine is picked up from the airport by her sister who describes what was like to return from a military deployment and reminds her of the challenge of coming home from her own time away. What Did You Learn (Campbell's Crossing of the Return Threshold): Describe what your client learned from this entire experience. Example: Our heroine comes back to her family and shares her experiences with them. Now she watches as her nieces easily use her invention to operate the television without a physical remote control. She is also reminded that the example of the children playing is how she arrived at her idea in the first place. Mastery Is Revealed (Campbell's Master of Two Worlds): Position your client as someone who now understands what it takes to be successful and is likely capable of replicating that success. Example: Our hero notices that the children playing with her new remote control interface ask sensible questions about why other things like cars, bikes and computers can't work this way. We know that she is just beginning to see the possibilities. Loss of Fear (Campbell's Freedom to Live): With success under their belt, your client now has the confidence to look for new success and trust their instincts. At this point, one might begin the story again to show how your opponent enters the story and the hero's journey begins anew with new challenges to their heroism. Example: While watching the kids at home and at complete peace, our heroine hears a knock at the door. It's a process server. Her former company is suing, claiming that the IP was developed on their dime. And so, the hero’s journey begins again, back to step one, only this time, it will be the jury that defines the ending. Be sure to sign up to be notified when the next part of this article is published. There are five more tips coming in the next article.